Forming the legal entity of your business is one of the first steps you should take in the start up phase of your business. The type of business you choose can have important benefits (or downsides) later on. It’s extremely important that you select the right business structure (and set it up correctly) to protect yourself against personal liability later down the road and to provide for the most beneficial tax structure. A sole proprietorship is the easiest and least expensive business to form and manage, however it does not provide protection against personal liability. An assumed name (DBA, or “Doing Business As”) is filed unless the individual’s business name is also their legal name. Taxes are generally reported on the person’s tax return as part of Schedule C.
A general partnership is similar to a sole proprietorship except that two or more people are owners of the business. Like a sole proprietorship, no specific filings or organization are needed, but a DBA should be filed if the business name is different than the partner’s names. Each partner is liable for the debts of the business. A limited partnership allows for one or more of the partners (known as “limited partners”) to limit their liability to the extent of their investment. The general partners are still personally liable for the debts of the business. Papers must be filed with the state to form a limited partnership. In order to form a Limited Liability Partnership, or LLP, the partnership needs to file a “Statement of Qualification” to elect the proper status. An LLC is formed by filing organization papers with the Secretary of State, known as “Articles of Organization”. Unless the LLC elects to be taxed as a corporation, it will be taxed like a partnership or sole proprietorship. LLC’s are flexible, easy to start, relatively low cost, and offer some specific tax advantages compared to a corporation. LLC’s seem to be gaining in popularity compared to S-Corp’s for these reasons. 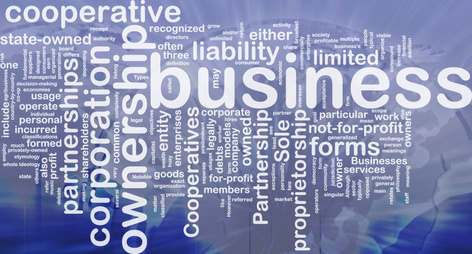 An LLC also protects you from personal liability from business debts or liabilities. A corporation is also formed by filing organization papers with the Secretary of State. The papers are called “Articles of Incorporation” and once filed a new business entity is created. A C-Corp is a separate entity which has its own taxpayer ID number and is taxed as a corporation. Shareholders are not liable for corporate debts with a few exceptions. An S-Corp is similar to a C-Corp is that it is a new entity and provides for personal liability protection. The difference is that an S-Corp is taxed similar to how a partnership is taxed. The combination of pass through taxation and protection from personal liability has made this a very popular form of entity. There are some restrictions however, and not all C-Corp’s qualify for S-Corp status per IRS regulations. Now that we have discussed some of the more common entities, please keep in mind that this is not an exhaustive list, and I am not a lawyer, nor is this specific legal advice. To be on safe side it’s recommended that you discuss your options with your attorney and work with them to get your business entity set up. The reality for most entrepreneurs, however, is that lawyers are cost prohibitive in the beginning (attorneys can charge thousands of dollars for this service) so another lower cost option is to use an online service. The most popular (and probably the most reputable) online legal services company is www.legalzoom.com. The service is easy to use, lower cost than hiring an attorney, and gets the job done quickly and efficiently. Well, I hope that you found this information helpful and if you have any questions, comments, or need any clarification on anything please feel free to contact me and I will get back to you ASAP! BEST OF LUCK TO YOU IN SETTING UP YOUR BUSINESS!